Add to Cart: Nordstrom Spring Sale! I woke up to a notification on my phone that there was a Nordstrom spring sale happening and I thought I’d do a quick round-up today! These are a few pieces that caught my eye as I was browsing through! There are a lot of newer pieces that got marked down quickly (like this wrap blouse I literally almost bought the other day in store) and this red floral dress! On the wrap blouse, I would stay true to size! PS: that red floral dress would look amazing with this suede jacket! I also wanted to point out that this Free People top I just wore on Monday is now on sale too! You can find it here and my post where I styled it here. It fits true to size. I’ve had my eyes on some wide leg pants either from Everlane or these Point Sur ones from J.Crew and look who turned up on sale?! The J.Crew ones! I love this look but I think I’m most partial to the light blue! What about you? 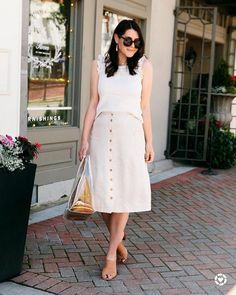 Would it be darling with this clean and classic top? You can find the full sale here! I’m a size 8 with a narrow waist. I carry my weight in my thighs. I can’t envision wide legs being “stunning” on me. Your thought? Oh I actually think they work for your body type! I would go with a slimmer top though, to show the more hourglass shape that they will create. Does that make sense? So like I would wear the wide leg with a simple, but fitted, tee to show your more narrow waist and to give a break in the look. I would also go with a heel with the wide leg trend, it helps length the pant leg and again with the heel it ‘breaks’ the look up so everything looks elevated and interesting!